Ant problems go from mild to severe in the blink of an eye. Because ants live, work, and travel in groups, you don’t usually realize you have an ant problem until it has already become a large-scale infestation. Traps are commonly used for pest control, but they are not effective against the large numbers ants tend to carry. Traps are not generally effective pest control anyway since they only address the pest that is caught, and not the deeper rooted infestation. Poisons are a popular form of pest control. 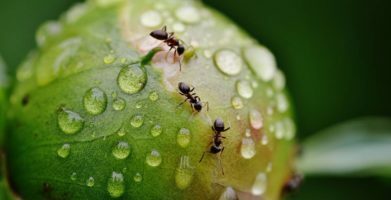 Killing ants can make you feel like you are solving your infestation, but it is difficult to kill the root of the problem. Ants have a sophisticated social structure centered upon a queen, who lays all of the eggs and is responsible for breeding and propagating the colony. The queen is well protected deep within a nest. Poisons may kill countless foragers and drones, but the queen will continue to lay eggs and the ants will continue to come. Repellents stop infestations before they begin. Using a natural repellent to control ant problems is not only more effective, but it is safe for people and pets. When you use a repellent, foraging ants will not find the area to be a good place to make their nest so you will not have to struggle to evict ants after they have set up a colony. 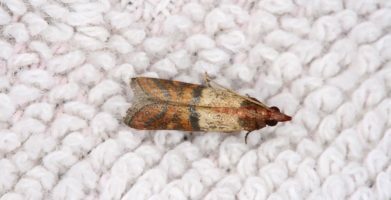 It is always easier to keep pests away from the beginning rather than trying to get rid of pests that have set up residence in or near your home. 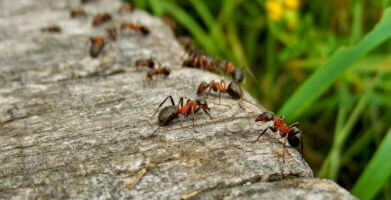 Stay Away® Ants is the best method of pest control for ants. There are no safety warnings for Stay Away® Ants because there are no known hazards of using this product. When used as directed, Stay Away® Ants does not present any health or safety risks to humans, animals, or the environment. You will not need to worry about small children or pets finding the Stay Away® Ants pouches, because the ingredients are harmless to humans and animals. Stay Away® Ants is made of botanical ingredients – lemongrass, peppermint and thyme essential oils are the active ingredients, and the remainder of the patented formulation is made of plant cellulose fiber from corn cob chips and sunflower oil as a carrier oil. The fragrance of Stay Away® Ants is pleasing to humans, but it makes ants avoid the area. When ants pick up the scent of Stay Away® Ants, they find another place to infest. Stay Away® Ants is guaranteed to get rid of ants. Turning them away before they come in and become a problem is the best way to stop ants! Ant problems go from mild to severe in the blink of an eye. Because ants live, work, and travel in groups, you don't usually realize you have an ant problem until it has already become a large-scale infestation. Traps are commonly used for pest control, but they are not effective against the large numbers ants tend to carry. Traps are not generally effective pest control anyway since they only address the pest that is caught, and not the deeper rooted infestation. Poisons are a popular form of pest control. Killing ants can make you feel like you are solving your infestation, but it is difficult to kill the root of the problem. Ants have a sophisticated social structure centered upon a queen, who lays all of the eggs and is responsible for breeding and propagating the colony. The queen is well protected deep within a nest. Poisons may kill countless foragers and drones, but the queen will continue to lay eggs and the ants will continue to come. Repellents stop infestations before they begin. Using a natural repellent to control ant problems is not only more effective, but it is safe for people and pets. When you use a repellent, foraging ants will not find the area to be a good place to make their nest so you will not have to struggle to evict ants after they have set up a colony. It is always easier to keep pests away from the beginning rather than trying to get rid of pests that have set up residence in or near your home. Stay Away® Ants is the best method of pest control for ants. There are no safety warnings for Stay Away® Ants because there are no known hazards of using this product. When used as directed, Stay Away® Ants does not present any health or safety risks to humans, animals, or the environment. 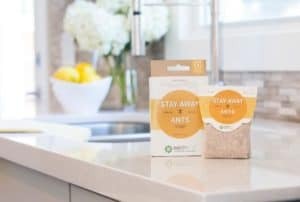 You will not need to worry about small children or pets finding the Stay Away® Ants pouches, because the ingredients are harmless to humans and animals. The fragrance of Stay Away® Ants is pleasing to humans, but it makes ants avoid the area. When ants pick up the scent of Stay Away® Ants, they find another place to infest. Stay Away® Ants is guaranteed to get rid of ants. Turning them away before they come in and become a problem is the best way to stop ants! string(21) "Pest Control for Ants"